Organ roller skating sessions....any in your area? Nice to speak with you Harry....I love Ralph's music, he sends me home exhausted and smiling every time, but I think he's being dragged kicking and screaming into the info age....ain't much on answering e mails! Regina how are the boots working out? Just fine Rick... thank you!!! no blister pads, no corn pads, no bunion pads needed!!! What a pleasure! needed... and boy..."they choose 'wisely'..."
of times on x-backs (Bounce Boogie was scary ) .... but stepping on an edge is no longer a guessing game! ps: I love the "cut down one hook"!!! I have to admit, that living in H-Town, I have never been to a Rink with organ Music. Seen it in the movies, and on TV. It sounds kinda cool. I also wish I could see one of the old Skating Palaces, from the last turn of the Century. Ladies in floor length dresses. and them having to put on their Skates in a separate area, so Men couldn't see their ankles. those most have been tha days. 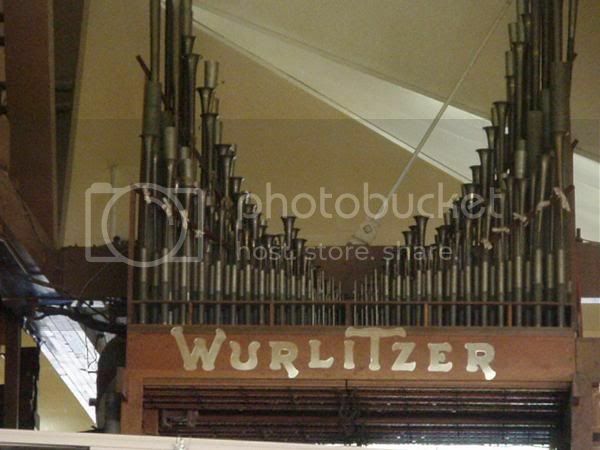 A far cry from the Victorian era pipe organ! Bob !!!!!!!!!!!!! And thank God for that !!! had enough of ....."don't let the boys see your knees and ears crap" in the 60's while in Catholic High School..... real sicko stuff!!! Hem lines had to be 3" below the knees and NO hairdo's that exposed the ears !!! I guess ankles were considered OK to look at by the 60's !!! Gee, wish I was a skater in the 60's.... can you imagine those little skirts and the effect they would of had??????????? Sorry Skateguy... those definetly were not 'the days' !!!!! Regina thats great news on the boots enjoy and be careful lol. That's it---I heard that before.--sounds kinda traditional. I've got an old Skate book from 79, that shows lots of Old skate history and Pix from the real old days. There would be 3000 Folks at the rink, with big balconies. I feel I was just born a little late for all that. but I bet is was great. Skating had just been invented, and was all the rage. And Adults only, at night. If I had big bucks--I'd build the finest Rink ever made. I found another roller skating rink with live organ music sessions. 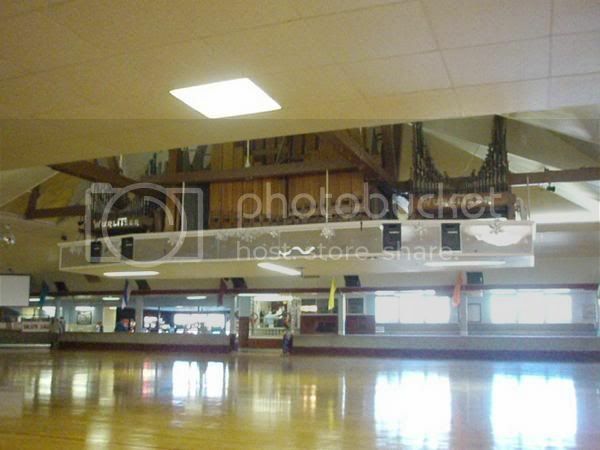 Skatetown Racine in Wisconsin has a Thursday morning adult skate with live organ music. I added them to the list of Live Organ Music Skating Sessions. Does anybody know who their organist is? We're really looking forward to a session on June 1st at Oaks Park with the organ. Even if you aren't interested, I thank you very much for the information! Edit: I has been assumed by some that this reply is a rub. It is not. I am truly grateful that someone not intrested in organ skating music took the time to list it here. Thank you again. ok, no problem. my reinterest in skating has kind of waned so i haven't been here to see the reply til now. if you say it's not a rub then that's fine by me. my original post wasn't either for what's it's worth. i just happened to go by the rink to get a catalog on the way to work one weekday afternoon and heard the organ music while i was there. that's how i know they do it, but that was all the info i could add. June Organist schedule for Sportsmans Hall....sorry I'm late! We missed too Bob... we were just to tired after doing yard work in the heat, it was 97 degrees late in the afternoon !!! But by 7:00 last night we regretted not going !!! Hope to be there this Sunday unless the kids have plans for Kenny for Father's Day. And "great" .... "air conditioning" KOOL! Marty goes on vacation in a few weeks (not sure of the dates) But Corey will be playing at Olympic one of the weeks and Lonnie the other week. I wasn't scared of the heat at the rink, I DJed 14 hours for a charity in almost 100 degrees. I needed a cool night off. Neat new avatar Hey, I've got Hershey Park tickets to use sometime this summer. I was thinking of making it an overnighter and finding a rink in the area. Any suggestions? Thank you for that Avatar !!! No rinks in Hershey that we know of. It's a 1/2 hour to 40 minutes to Olympic and also about that far to Fantasy in Reading. But Bob, I am sure you two will find plenty to do in Hershey. Both in the Park and in Town.... Also, check with Corey to find out which Tuesday night in July he will be playing at Olympic. It's just starting to get cool in the shop again. The power was off today and just came on 10 minutes ago. Don't think I would ever skate again without air conditioning. Did enough of the in the 70's !!! here also is a link for all the rinks in Pa.
PA, NJ, MD Skaters ... Sportsman's Hall (http://www.sportsmanshall.com/) 1st Annual "Corn Roast Dinner" ... Sunday Aug.31. "Hot Dog, Corn and Soda Dinner" (please bring a covered dish too) 5 hours of fun and skating for $10.00 !!! 5pm to 7pm Dinner - 6pm to 10pm Skate ... Rumor has it all 3 Organist's will be playing !!! It's Official now.... Sportsman's Hall has it on their calendar !!! Ralph, Corey and Marty will all be playing !!! The evening to be very reminisant of the 70's and 80's Corn Roast Dinners at Fountain Blu !! !